Broadcasting legend and Iowa State Professor Emeritus Jack Shelley passed away earlier this week. To learn more about renowned radio and television correspondent Jack Shelley, read the tribute by ISU Greenlee School of Journalism Director and Professor Michael Bugeja and other colleagues, detailing the remarkable life and career of John D. “Jack” Shelley. Shelley worked for many years at WHO (1935-1965) and was a war correspondent (1944-1945) in both Europe and the Pacific during World War II. Among his many accomplishments, he interviewed hundreds of combat soldiers, recorded one of the first broadcast interviews with crew members of the airplanes that dropped the atomic bombs on Hiroshima and Nagasaki, was aboard the battleship U.S.S. Missouri in Tokyo Bay to cover the Allies’ acceptance of the Japanese surrender, and was one of twenty reporters chosen to cover the atomic bomb tests at Yucca Flats, Nevada (1953). The University Archives holds the Papers of Jack Shelley. The materials from Shelley’s time as a war correspondent in World War II comprise the majority of the collection. There is not a lot of material from his time here at Iowa State University as a journalism professor, except in the folder of biographical material. The collection includes biographical information and personal memorabilia from his travels as a war correspondent, radio broadcast scripts, war documents, cablegrams, news releases and clippings, personal accounts and reports of events witnessed, family correspondence, photographs, and audio recordings. Four broadcasts by Shelley are available on iTunes U, including interviews with the atomic bomb crews, reports on the Japanese surrender on the Battleship Missouri, and Yucca Flats interviews before and during the atomic blasts. 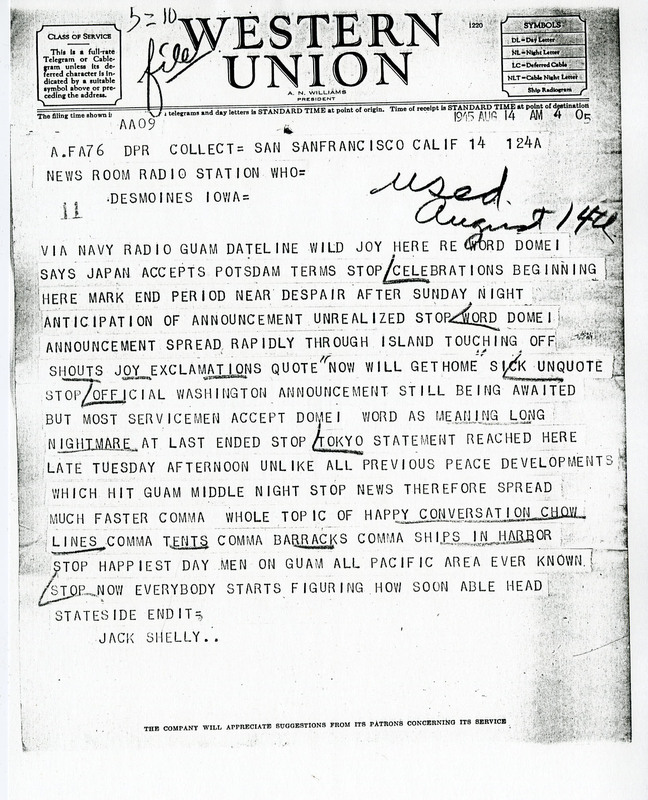 Cable transmission from Jack Shelly announcing that the troups had heard the news of Japan’s surrender. 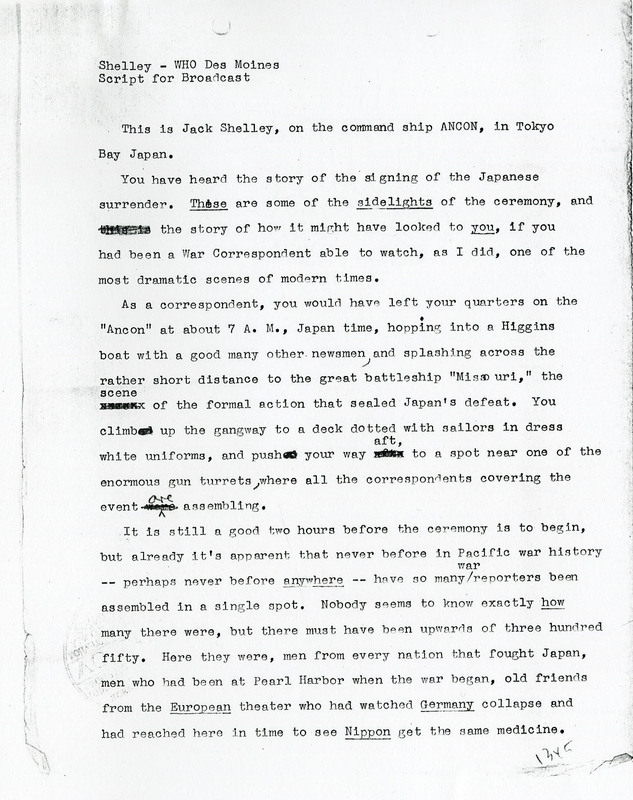 First page of the broadcast script in which Shelley describes the official Japanese surrender, including some of the “sidelights of the ceremony” and what it was like as a war correspondent witnessing the event. To see the rest of the script, as well as other materials within Jack Shelley’s collection, please come visit the Special Collections Department. The collection’s finding aid/description is available online. In addition to the Jack Shelley Papers briefly described above, Jack Shelley donated the papers of his aunt, Kate Shelley, to the department. Kate Shelley is known for heroically crawling across a railroad bridge during a severe storm to warn the local railroad station about a fallen bridge before an express train was to cross, saving the lives of its passengers and crew. Her collection is available for viewing in our reading room, and the collection’s finding aid is also available online. This entry was posted in University Archives and tagged ISU faculty, journalism. Bookmark the permalink. Impressed once again with Des Moines’ 20th century journalists!